We are once again heading to NAB in Las Vegas and this year we will join the team of MistServer. We have a lot of exciting news, here’s a summary of what you can expect to find at our stand – SU13808CM. The release of our new mobile encoder is just around the corner. Among other features the unit will have up to 8 SIM-cards, 2xSDI & 2xHDMI inputs, WiFi, and h.264 & h.265. The “backpack” is based on the Easyrig vest which is both ergonomic and can also be combined with their camera rig. BRT is optimized for live video via public internet. 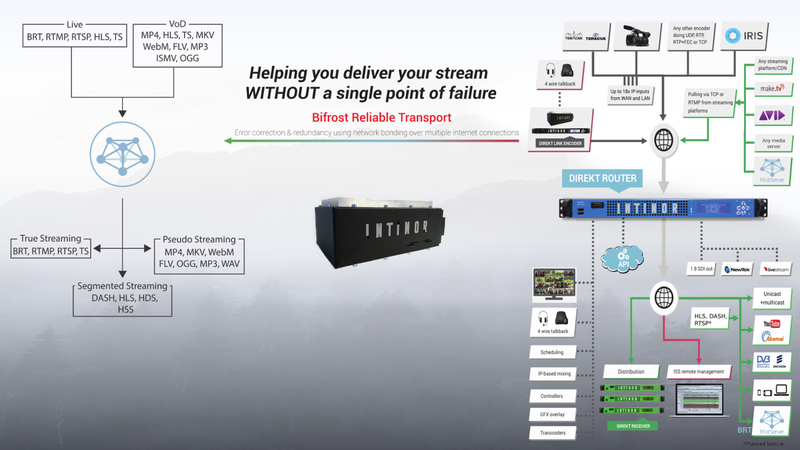 BRT combines adaptive bitrate streaming with error correction and bonding (2xLAN, 1xWiFi client, 8xSIM) offering redundancy for internet connections with the highest possible robustness. BRT helps you to deliver your stream WITHOUT a single point of failure to the MistServer OTT-streaming media platform. Download the PDF for more information. The possibility to control video streams, audio and mixer tables over LAN makes the workflow easier and more cost efficient for our customers. Therefore we are really excited to offer NDI out on our Router.